"Rocket Science," a book by Andrew Rader, has rocketed past its goal on Kickstarter. 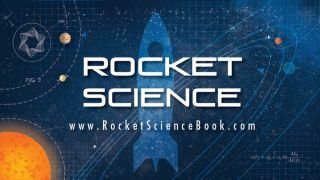 While rocket science is notoriously tough to understand, a new book by an aerospace engineer shows it can be explained in a simple way. The book, "Rocket Science," discusses orbits and physics for readers as young as 6, and features eye-catching illustrations that people of all ages can appreciate. The project has raised more than $35,000 on Kickstarter to print copies of the book, nearly doubling the $19,183 goal originally set, and there's still over two weeks to go, with contributions closing Dec. 6. "Why do rockets use staging? What's an orbit? Is there gravity in space? How did we get to the moon? How would we get to Mars? How do we travel into deep space? Could we get to another star? These are just a few of the questions answered in 'Rocket Science,'" the Kickstarter description adds. The book contains 42 illustrations and is targeted at children ages 6 to 10. It represents the third book collaboration between Rader and Frazer; the other two were titled "Epic Space Adventure" and "Mars Rover Rescue," and both were aimed at a young audience. Some of the awards for supporting the Kickstarter campaign include an 18 x 24 illustrated poster of the entire solar system, a set of autographed books, a mission patch, a planet and moon sticker pack, an e-book and even a "secret bonus." Classrooms can contribute $275 or more to get a "bundle pack" that includes 30 copies of the book and a 20-minute space exploration Skype Q&A with Rader.